My childhood growing up in the pearling town of Broome is filled with amazing memories. Broome was, from my understanding, the only place in Australia where the White Australia Policy did not seem to apply because the demand for pearls and the pearl shell industry brought men in from all parts of Asia. In the mid 1930s, after a cyclone that destroyed many luggers and lives, my father came to Broome from West Timor as a Dutch National. Official records show he spent time in the Dutch Merchant Navy on board the ship Gorgon. And on the morning of the 3rd March 1942 he took part in defending Dutch civilians being evacuated from Indonesia when there was a surprise attack on Broome by nine Japanese zero fighter aircraft. The attack destroyed many flying boats and other allied aircraft stationed in Broome, and there also were many deaths. My father stayed on in Broome and joined the pearling industry. Soon he ended up as a Head Diver, working for several of the Pearling Masters; he had his own home and a boarding house for his crew. Later he set up several businesses - a laundry, barber shop, a general boarding house, fish shop, and the first registered fish trap in Roebuck Bay. As this trap required clearing twice a day he walked past the Aboriginals camped along the beach on his way back to the shop and always gave them fish, easing his catch before selling to the public. Our home was open to anyone and everyone, and we gave refuge to many who were down on their luck and in need of a place to lay their head before setting off again. Many of these people returned with gifts, and we were also rewarded with stories of their adventures. These memories of Broome showcase a vibrant community spirit where everyone cared and looked each other, no matter the religion or a heritage. Regular parties were held in the Japanese or Malay quarters, there were lugger picnics, plays and dances which were held regularly at the Civic Centre. All of these ingredients led to families of Aboriginal and Asian heritage becoming the ‘Old Families of Broome’ and to the formation of the annual Shinju Matsuri or The Festival of the Pearl. It was truly a rich and civil society, and this has served me well in my adult life. The values of empathy and a hunger for knowledge brought with it the need for a strong work ethic and a sense of right from wrong. Broome had a history of Aboriginal women entering the field of nursing and I chose this as my first career choice. After working in this field for over a decade I directed my focus toward education, well being and the sciences. Now, as an Indigenous scientist I describe myself as a specialist, a generalist and a broker focused on collaboration of knowledge building and action. Indigenous science is slowly becoming recognized and valued as Indigenous peoples of the world have unique knowledge systems that can contribute to all fields of scientific endeavours - particularly of generational experiences of being witness to changing biodiversity and cultural landscapes. The recognition of Australian Indigenous knowledge systems, generated over thousands of years with its application in multiple fields, was documented in a report titled, Indigenous Engagement with Science Towards Deeper Understandings in 2013 (see http://www.innovation.gov.au). From my view, the major challenge of generating and maintaining Indigenous knowledge systems and intergenerational practice is not simply an issue of science engagement, but an issue of international importance; the earth’s co-existence with humanity. The solutions presented by Indigenous researchers and scientists and knowledge-holders are based in a trans-disciplinary approach of a collective wisdom - it’s an approach that recognizes and celebrates unity in diversity. The opportunity to invest in future partnerships which values and includes Indigenous science with western and scientists/researchers needs to be realised. These partnerships must recognize and respect that the Earth has rights, and we must guarantee custodianship of the commons, reliable prosperity and sustainable world development. The United Nation Declaration of Human Rights (1948) promotes the wellbeing and sacredness of all life not just human life. In the words of 22 Indigenous Philosophers in the Redstone Statement, we are at a tipping point, and it is essential for non-Indigenous and Indigenous, native and non-native people to act now - to hold and care for Mother Earth in order to protect the sacredness of all life. This world belongs to all of us and we must again learn to live, love and work together to protect the sacredness of all life. And as traditional custodians in Australia we recognise and value the protection of all inhabitants who are connected to ancient geological and living water systems, rivers, the arteries giving life to our dry, sunburnt country. As a local government councillor and broker, I am advocating for an alternative culture and conservation economy around green collar jobs in eco-system services of tourism, fire, land, water and natural resource management. Because it is these programs which will provide culturally appropriate, sustainable employment for local people. Senior Nyikina Elder, Lucy Marshall, says we should be calling for financial, legal and entrepreneurial support to bring together Aboriginal and non-Aboriginal people in the custodianship of our Australian sovereign lands and waters, and is confident that ‘we still have a role to play’. There are still huge gaps in the baseline data of our marine and freshwater ecology, and amongst the cultural and environmental landscape; what we in the Kimberley know and love as the hill, sea, and desert and river country. We need to seriously consider what would be the replacement values if these assets were destroyed. How do you value the Mardoowarra? How do you determine this sacred river’s replacement value? How do Indigenous people maintain culture when that involves hunting and fishing, drinking, bathing and having ceremony at the river? What would be the cost to recover one of Australia’s wild rivers, its rich culture and bio-diversity? The fact is no amount of money can build a living river system with such rich and diverse habitats that are not found anywhere else on this planet. In the case of mining and resource exploitation on the Mardoowarra and into the Canning Super Basin there is an existing body of evidence to demonstrate there are real and serious risks. 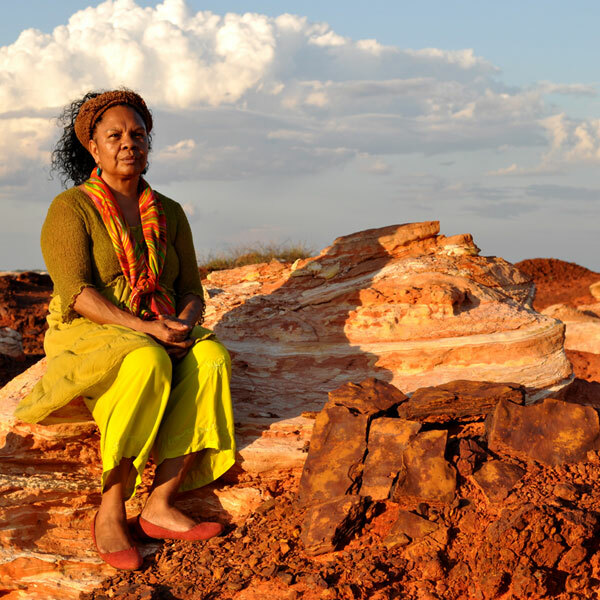 Many traditional custodians and other Kimberley people are advocating for more science and the inclusion of traditional ecological and cultural knowledge to demonstrate the need to protect the lives of all people who live, love and recreate in the region. We are appealing to all Australians - and the world family. The Kimberley is a precious resource that belongs to all of us. We need to consciously work together to protect the Kimberley for current and future generations of Australians and indeed the world. The senior elders from many Kimberley Indigenous Nations tell me there is a way forward, a way that is based on Aboriginal customs and laws of the ‘Wunan’. The Wunan covered an extensive trade exchange and cultural landscape which included the whole of the Kimberley across to central Australia (Warlpiri) and up to Uluru, Kakadu in the Northern Territory, and back to the Kimberley. These principles enshrined co-existence and co-management amongst linguistically and culturally diverse tribes over vast managed Aboriginal estates. Songlines which described and mapped the physical and spiritual pathways through Aboriginal tribal lands and waters, connecting traditional networks through ceremonial and trade exchange. These codes of conduct ‘of common law’ were upheld for millennia prior to colonisation. We have a responsibility as scientists, researchers and practitioners to generate multiple bodies of information and practice to inform our role, not as activist but as actionist. I am passionate about working in a dialogic action way to bring about transformational change in the recognition and promotion of the multiple values of this uniquely rich Australian cultural landscape. Late last year with fellow Australians we showcased and shared the places we love (you can see it here https://www.youtube.com/watch?v=VBh0gnwzuwI). The Kimberley region of Western Australia is considered one of the last great wildernesses of the world. Huge areas of the region were National Heritage Listed in 2011 for multiple world values containing vast wetlands, a rich feeding ground for many species of migratory birds, the world’s largest dinosaur footprints and extensive track ways, ancient rock art, pristine coast lines, rich eco-systems, and a unique living Indigenous cultures co-existing with Asian and European heritage. And yet lurking deep within these ancient lands are more of mining corporations’ extractive dreams for coal, uranium, bauxite, copper, iron ore, coal seam and shale gas, diamonds and other precious metals. We are at a critical point in our history where some of the proposed developments present a real threat to the land, water, food and energy security, as well as our Kimberley way of life. Many in the region are not anti-development, rather we are anti-unethical development - particularly development at all cost. We need transparent ‘participatory planning’ which values existing assets and includes people in planning. My current focus is the planning, development and delivery of a Mardoowarra (Fitzroy River) and the Broome Coast Global Geo Park. Investment needs to go into conducting a Feasibility Study to build on the recognition of national cultural and environmental heritage landscapes. The time is right to build a body of evidence, for valuing these multiple assets as a geo world parks. We need to map alternative strategies for innovation and diverse economies on country if we want reliable prosperity and a sustainable common future against climate chaos. I am not against resource development if it can be done in an ethical and responsible way. However, if science and industry is not certain of the safety, and the cultural issues are not resolved; traditional custodians must have the right to veto mining on their land. As Australian citizens and First Nations people with distinct land and water rights, we can manage land in agreement with the principles of sustainable action. I have a dream for a ‘Great Australian Story’ that we as Australians; Indigenous peoples, pastoralists, graziers, farmers, conservationists and scientists, stand together for land, water, food and energy security. I believe in a time of reflection around constitutional changes that we need to redefine who we are as AUSTRALIANS and our values of sovereignty. We too can walk in our dreams and hold this land together for all of us and make a reality of the claim once again that, Australia is a Lucky Country - with a Fair Go for all.